JERUSALEM (JTA) — Israel Police pushed Arab rioters on the Temple Mount into the Al-Aksa Mosque and locked them inside. Police who raided the mount early Monday morning following prayers at the mosque were attacked by the rioters, who had collected rocks, firebombs and broken pieces of furniture in preparation for attacks on police and Jewish visitors, according to reports. The rioters also used barbed wire to barricade parts of the site. The Israeli forces used stun grenades, tear gas and rubber-coated bullets to contain the rioters, according to the Palestinian Maan news agency. Jews were allowed to visit the Temple Mount on Monday for the first time since the start of the Sukkot holiday last week. Among the visitors was right-wing Likud lawmaker Moshe Feiglin, who requested permission to bring a group to visit the Temple Mount following holiday prayers at the Western Wall. “A pilgrimage to the courtyard of our Holy Temple should be accompanied by poetry, drums and song — not the background sounds of explosions and gunshots as riot police officers prevent the rioters from leaving their mosque,” Feiglin wrote in a Facebook post following the visit. Police began clamping down on security in the Old City of Jerusalem on Sunday, adding extra patrols and closing the major streets around the area to traffic. 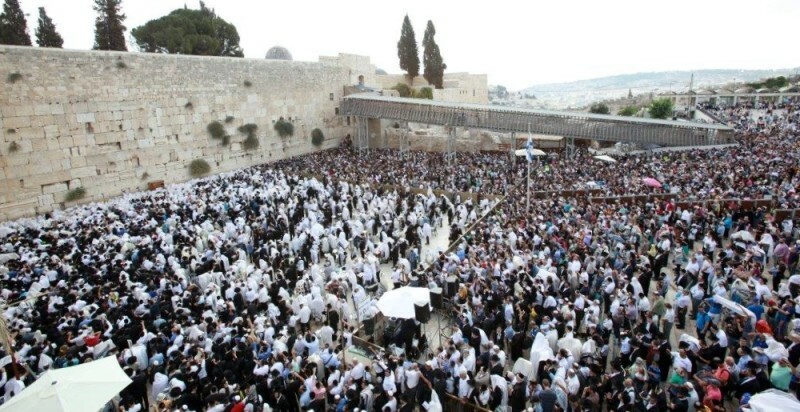 Tens of thousands of Jewish worshippers from Israel and abroad gathered at the Western Wall on Sunday for the traditional Birkat Kohanim, or priestly blessing prayer. On Friday, Israel Police restricted the entry of Muslim men to the Temple Mount to those over the age of 50 in response to riots at the holy site two days earlier. Four policemen were injured during the violence and at least five protesters were arrested, according to Israel Police.